Thank you to everyone for a super start to the year. Term 1 has been full of exciting ‘firsts’, students have settled well and progress has been made by all of our students. As the school holidays approach this can be a tricky time to convince your child to continue with their regular reading schedule. Here are some fun ways you can keep your child reading over the school holidays. Create ‘DEAR’ times at home. DEAR stands for ‘Drop Everything and Read’ and is implemented in many schools and classrooms. It’s simple: during DEAR time everybody in the house must drop what they’re doing and read. This can become a fun competition counting the number of words read. Take part in story times at your local library. Many libraries host story time sessions or reading groups for different ages. It’s a great way for your child to read and talk about new books with others their own age and to view reading as an enjoyable activity that can be shared. Let your child show off their reading skills to relatives or friends. The holidays are a great time to get together with relatives and friends and have a reading competition or quiz with some exciting prizes. Read and talk about books in the car. Lengthy car-trips are a hallmark of the school holidays and are a perfect time for the family to enjoy having long chats together about books that have been read or that children are currently reading. Put out 1 finger for every word you do not know or cannot pronounce. If you have 5 fingers out, the book is too difficult to read without help. If you do not get any fingers up, but are reading very slowly and decoding almost every word, you will not enjoy the book. 1 Finger: This book is o.k. for you. 3 Fingers: Could be a bit hard for you to understand. 4 Fingers: Will be too difficult to read and understand. 5 Fingers: Choose another book. Thank you to all the parents and caregivers who attended the Parent Teacher Interviews and Student-led Conferences, I had the opportunity to chat with parents who I had not yet met and to listen to children share their growth as a learner with their parents. During Student-led Conferences, discussions around learning help children to articulate their progress and achievement and set goals. Your positive support as we work together to guide the learning of our children is so essential and extremely valued. Thank you to all parents who juggled busy lives to attend. This year’s GCC Anzac Service will be held in the Sports Centre rather than the Undercover Area. 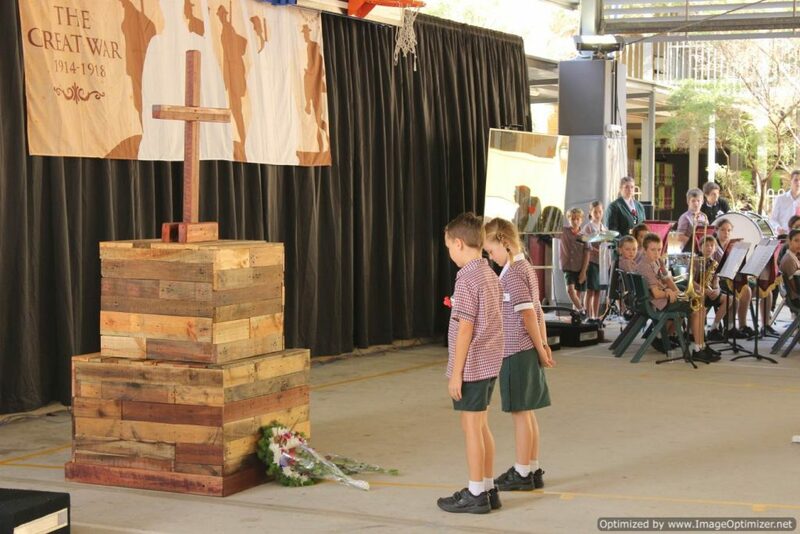 Our ANZAC Commemorative Service will be held on Wednesday 24 April at 8:45am in the Sports Centre. Parents are most welcome to attend. The ANZAC march is always very well attended by our students and will take place on Saturday 26 April. The march will begin in the Coochin Creek Co-Op car park on Simpson Street and everyone is asked to assemble at 9:15am with the march stepping off at 9:30am. I would like to take this opportunity to thank all our Primary staff for being such an amazing team and for their hard work and commitment this term. I would like to wish everyone a happy, safe and blessed Easter holiday and I look forward to seeing you all again when we return back to school on Tuesday 23 April. This entry was posted in Primary School News and tagged ANZAC, Parent Teacher Interviews on April 4, 2019 by sandy.